Those of you who’ve been reading my interviews with album cover artists over the years have seen many examples of “crossover” talents. In some cases, its musicians who, whether through their genes or through constant exposure to the visual arts, have taken on very active roles – as art director, illustrator, designer, photographer or muse – in the projects that produce the imagery that helps promote their music to the press and fan bases. In other examples, it is a visual artist’s exposure to new music (and the people that make it) that leads them to pursue opportunities to collaborate with a musical act or their label’s art departments. I’ve also shown you several instances when a visual artist who has built a portfolio of work for clients in the music business has then gone on to more/greater fame in other aspects of the art world (fine art, music videos, film and television, advertising, etc.). Back in 2009, I published an interview article about a design firm called Pacific Eye & Ear (lead by Ernie Cefalu) who had an illustrator on staff at the time – Drew Struzan – who’d done some memorable covers in the 1970s for musical acts including Black Sabbath, Alice Cooper, Iron Butterfly, Bee Gees and others – who’d later go on to great fame and fortune as a movie poster artist, creating iconic images for movie series including Star Wars, Indiana Jones, Harry Potter, Back To The Future and many, many more. Drew was a commercial artist (he stopped taking on commercial commissions several years ago) who learned how to work in a variety of traditional media – acrylics, pen and ink, airbrush, etc. – and then brought his own unique eye and abilities to create masterworks for each of his clients and, as a result, became an artist greatly respected by both music/movie fans and experts/critics in the fine art world. 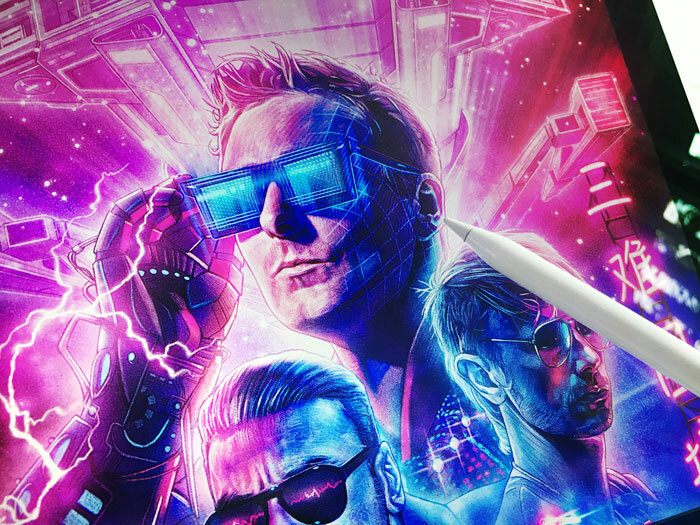 Last year, working to update a list of people who’d worked on Grammy Award-winning projects (in this case, the rock band Muse and their 2016 “Best Rock Album”-winning effort Drones), I saw an article about the band’s then-upcoming release (Simulation Theory, released in November, 2018 on Warner Bros. Records) and that they’d hired a young movie poster artist – Kyle Lambert, whose work on promo imagery for hit movies including Stranger Things and Jurassic Park, among others – to work with them to come up with just the right cover art for that record and was so impressed with his successful effort on that music industry project – his first album cover – that I knew I’d have to find out more and share that conversation with you. Lambert’s choice of digital tools might rankle the egos of certain purists from the art world, but the results – done with a fan’s passion for his subject material – are certain to have evoked wide smiles from both casual fans of the visual arts to the most die-hard of ComicCon attendees. Mike Goldstein, AlbumCoverHallofFame.com – Kyle, I first want to thank you for taking a break for a few minutes from what seems to be a very busy work schedule to answer a few questions about your project with Muse. If it’s OK with you, I’d like to first take you through my “regular” list of questions and so, to get things started, can you tell me how it was that you were first introduced to your clients – that is Muse, their management, the label or anyone else who served as your artistic cohorts on this project? Had you worked with them before? Kyle Lambert – This was the first time I worked with Muse. I was contacted by Creative Director Jesse Lee Stout on behalf of the band to create the album cover for what would be their eighth studio album. Jesse was my point of contact throughout the process and the one who provided me with the brief and supplied feedback at various stages of the process. Mike G – Prior to working on this project, were you familiar at all with the band, it’s “style” and approach to music and their back catalog? Kyle L – I grew up listening to Muse while I was in school. I remember the song “Time Is Running Out” (from the 2003 album Absolution – MG) being a particular favorite among my friends. When I was hired for this job, I immediately went back to their catalog and listened to their music to reacquaint myself with their sound. MG – I really want to know a) whether you got to hear any of the new record’s music before starting on the design project and b) whether any of the music influenced your approach to the design. KL – At the time I was brought on board for the project, Muse had already released three singles that would be featured on the album and also had produced some visually creative music videos. 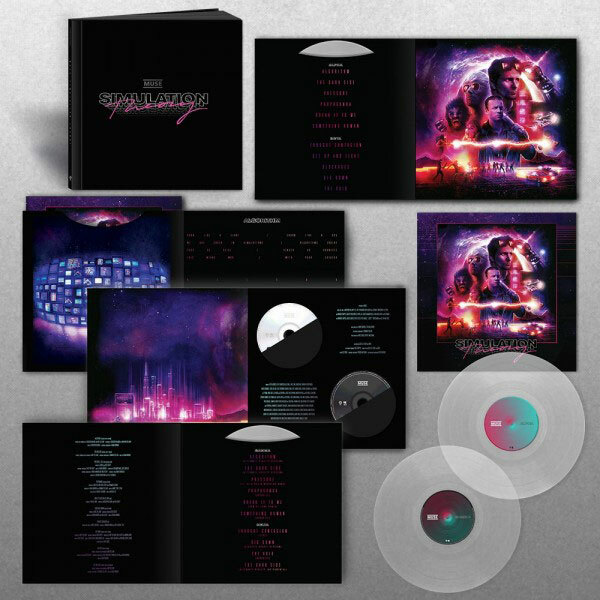 MG – So, was there a particular track from the record’s track list of what was to be included in the package – or something special about the music overall – that served as the inspiration for the package’s overall design? 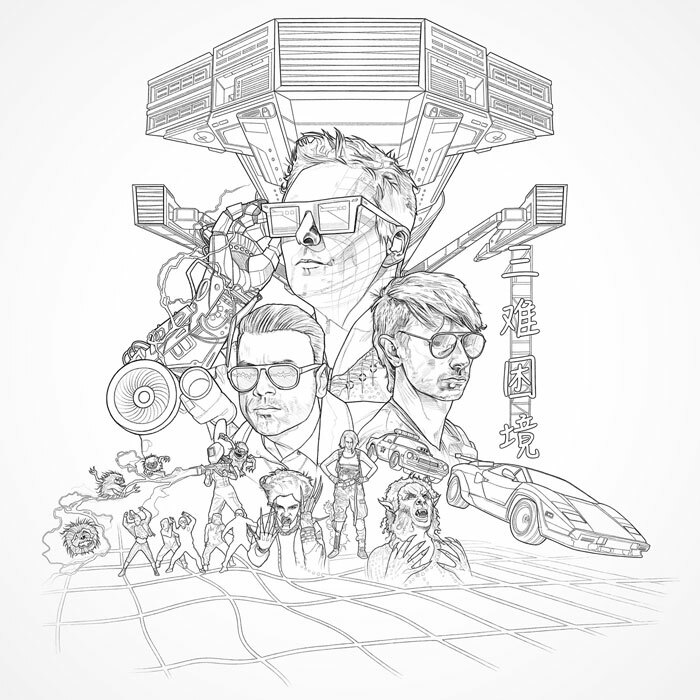 KL – The final art combines portraits of Matt (Bellamy), Chris (Wolstenholme) and Dom (i.e., Dominic Howard) with the characters seen in the music videos for the songs “Something Human”,” Thought Contagion”, “Dig Down” and “The Dark Side”. In particular, I really responded to the video for the track “Thought Contagion”. The video has a really vibrant color palette and was filled with characters that looked like they belonged in a science fiction movie. After seeing it, I had a very clear idea about what I wanted to create for the album cover. 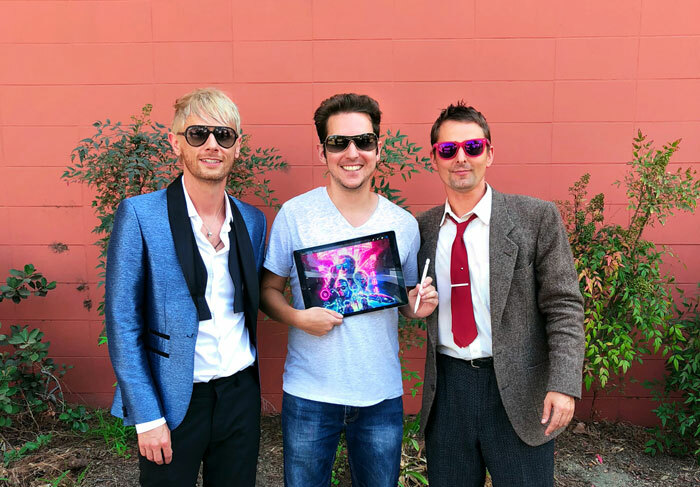 MG – Knowing what you grew to know about the people involved and your overall knowledge of “what works” in the entertainment business, do you feel that there’s something that makes Muse different from other bands in their “category”? Was the band – or the people at Warner Bros. Records – known to have a particular approach to promoting and packaging their music? KL – Muse are a notoriously creative band, and the band members are the driving force behind all aspects related to their music. The idea to have a movie poster image serve as the album cover came from Dom, who was also involved in reviewing my designs throughout the process. I think this direct contact with the artists was refreshing and led to the artwork being a true reflection of the sound of the album. For Muse, this was a unique approach to advertising their music, as they had never previously appeared personally on any of their album covers. MG – Certainly a good example of a band working hard to deliver something “more” to their fans. So, let’s talk tech for a bit. How did you choose the tools you’d use on this effort? Can you help me better understand the “how the heck did you do that?” aspects of the project? I know that Apple products were used pretty extensively, but do you normally use their hardware and software to create your art? KL – The workflow that I used for this album cover is consistent with how I’ve worked on movie posters in the past. I use an app called Procreate on an iPad Pro with the Apple Pencil to sketch the initial idea for the artwork, and to do the detailed drawing. I use these tools because the Apple Pencil provides me with a very natural drawing experience, and this setup also allows me to work mobile if necessary. Most of the coloring is done using Adobe Photoshop on a Mac in combination with a Wacom tablet. I prefer to color in Photoshop because, at this stage of the process, I need a lot of layers and working on a bigger screen helps see more of the artwork. To finish it, I go back to Procreate to add some final highlights and details. MG – It seems like you’ve found a good set of tools for this kind of work. Can you tell me whether any other special tools or techniques were used and incorporated into your work processes and how they helped you create the finished product? KL – One of the aspects of the artwork that took a while to figure out was the spaceship you see at the top. Initially, I placed a smaller version in the top right hand corner at an angle, but everybody wanted a more prominent placement for it. They felt it would be cool to have the spaceship looming above the band, similar to how Star Wars movies begin (Editor’s Note – the original Star Wars movie poster displayed the dreaded Death Star space ship and other fighter vessels). I thought this was a great idea, but it did lead me down a path of drawing multiple iterations of the ship to convince the viewer that it’s coming towards them. For the final version, the ship is perfectly centered, which allowed me to use a feature in Procreate called the “symmetry tool”. It essentially let me draw only half of the ship, and then this tool mirrored my drawing on the other side of the page, which saved me a ton of time. MG – Taking into account all of the production coordination needed for this work, can you tell me how long this process took – from start to finished product? KL – I was given two weeks to illustrate the cover, which is quite typical for the entertainment industry, where everything is heading towards a specific release date, and so a quick turnaround is expected. This timeline also included a few rounds of changes and approval processes. MG – So, no sleep allowed, right? While you’ve already described a lot about the process and how and when the artists were involved in the day-to-day development and review of your work, when all was said and done, did you feel as though you were given enough time and resources to do what you wanted to do? Were your clients happy with the results, and how did they express that to you? KL-Like you said, most of this was already answered in your previous questions, but I can tell you that Muse were really happy with how the final artwork turned out. The band invited me to meet them a few weeks after finishing the project, and I got to personally give them an insight into my work process. MG – Of course, as I’m always hoping to give my readers something special in my interview articles, I’d like to ask you – without betraying any confidences, of course – if there are any other anecdotal bits of info about this project you’d be willing to share…every project I’ve ever looked into seems to have something of an “a-ha moment” or an “OMG moment”, so anything you’d be willing to share with me and my readers would be quite a treat! KL – For me, my “OMG moments” have been seeing the reception of the artwork and all of the creative ways it has been used to market the album. Beyond posters and billboards, it was also turned into a digital coloring book, a retro 80s cassette, an Etch-A-Sketch portrait and a wrap for an arcade game. It was even featured in the music video for another track from the album – “Algorithm”! Born in July, 1987 and raised and educated in Manchester, U.K., Kyle Lambert is an Illustrator whose portfolio includes advertising/promo and related work for a number of the world’s top brands including Apple, Adobe, Disney, GQ, Marvel, NBC, Netflix, Paramount Studios, the San Diego Zoo, Sony Pictures, Universal Studios, Vanity Fair and Variety, among others. He is perhaps best known for his artwork for the hugely-popular and award-winning Netflix science fiction/horror series Stranger Things, but fans have also raved about his artwork for The Blacklist and Timeless for NBC, Steven Spielberg and J.J. Abrams’ 2011 film Super 8 and posters and packaging he’s done for releases for the films Jumanji, Jurassic Park and Wicker Man. He continued his work for Apple Inc., U.K., as a Creative Trainer, teaching students how to use creative applications (such as the Final Cut Studio, Aperture, iLife, iWork, Adobe’s Photoshop, Illustrator and After Effects as well as Autodesk’s Maya 3-D modeling package) while providing them with the support and inspiration they’d need to launch their own careers. 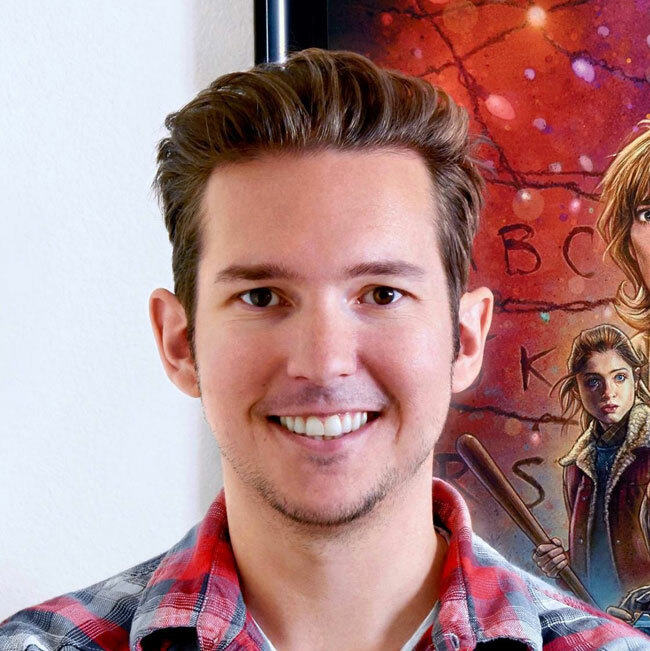 He moved to Los Angeles, CA in 2016 to open his own studio (Kyle Art Studio) after he completed his commission to do the poster artwork for Season 1 of the aforementioned Stranger Things series for Netflix and where he’s been kept quite busy ever since. 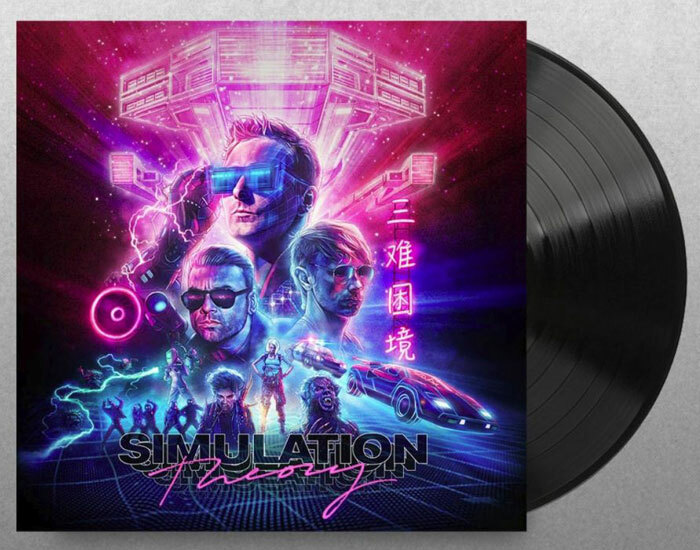 Originally released in November 2018 via multiple formats (CD, Deluxe CD, Vinyl, Cassette and Digital Downloads, as well as a CD/Vinyl Box Set) on Warner Bros. Records, Simulation Theory immediately topped the U.K., Dutch and Swiss sales charts (topping out at #12 on the Billboard charts in the U.S.). In addition to Kyle’s design and illustration credits (for the cover and for related merchandise, including clothing, song books and lithograph prints based on his artwork), other packaging/production credits go to MUSE and Jesse Lee Stout for Art Direction and Jesse Lee Stout and Alex Tenta for Graphic Design. For the Deluxe set, that artwork was created by artist Paul Shipper. All images are credited as noted – Copyright 2018-2019 Kyle Lambert, Muse and Greg Preston – and are used by permission to illustrate this article. All text Copyright 2019 Mike Goldstein/AlbumCoverHallofFame.com – All rights reserved. This entry was posted in Album Cover Artist Interviews and tagged ACHOF, album cover, album cover art, Album Cover Hall of Fame, Album Covers, article, award winner, CD cover, illustrator, interview, Kyle Lambert, Mike Goldstein, Muse, packaging, record sleeve, Simulation Theory, Warner Bros.. Bookmark the permalink.